(e) the details of steps taken/being taken for the speedy disposal of such cases/complaints and safeguarding the interests of SC/ST employees in the Railways? (a): Ministry of Railways have a reservation cell at all levels i.e. Railway Board, Zonal Railway Headquarters and Divisional Headquarters which looks after the interests of Scheduled Caste (SC)/Scheduled Tribe (ST) employees on the Railways and also ensures implementation of the instructions, issued from time to time in regard to Reservation Rules and grievance redressal. Officers from SC/ST Community are nominated as Liaison Officers at the Railway Board, Zonal Railway and Divisional Headquarters. Grievances of SCs/STs employees received from various forums, including National Commission for Scheduled Castes, National Commission for Scheduled Tribes, Hon’ble Ministers, Members of Parliament, MLAs and other sources are examined with respect to extant rules and based on the factual position, appropriate action is taken at the appropriate level. At the field level also i.e. the Stations, Sheds, Workshops, Grievance Registers are provided exclusively for the SC/ST employees, where they can record their grievances. 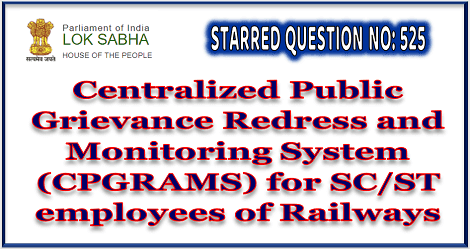 SC/ST railway employees can also register their grievances on-line on the Centralized Public Grievance Redress And Monitoring System (CPGRAMS) developed by Department of Administrative Reforms and Public Grievances. These grievances are remitted to the concerned Railway authorities for speedy redressal. (c): During the last 3 years (2015-2017), 57 complaints of SC/ST employees regarding harassment on the basis of Casteism have been received in the Railways, out of which 50 cases have been finalized. Balance 7 cases are under the various stages of investigation/examination. (d) & (e): Such complaints are taken very seriously by the Administration. If after due investigation, the case is proved, immediate necessary action is taken against the erring Officials. Time taken for Investigation of such cases, varies from case to case.